Here are some of the changes you will notice when upgrading to Office 2016 from Office 2013 or 2010. Note You cannot pin folders to the recently used list in Office 2016, but you can pin files. Refer to this Microsoft support page for more information. Tell me what you want to do. This new feature allows you to type a word or phrase to quickly access an action or function. Smart Lookup. 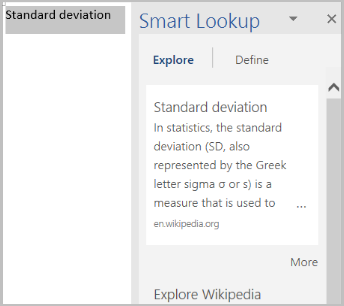 Highlight a word and select Smart Lookup to quickly pull up related information (definition, background information, etc.). The Acrobat ribbon is gone, but you can open, edit, and save a PDF file in Word 2016. Microsoft added a number of new charts, including Treemap, Histogram, Waterfall, Box and Whisker, and Sunburst. There are new themes to choose from, and Variants to the themes with different fonts, color schemes, and backgrounds.